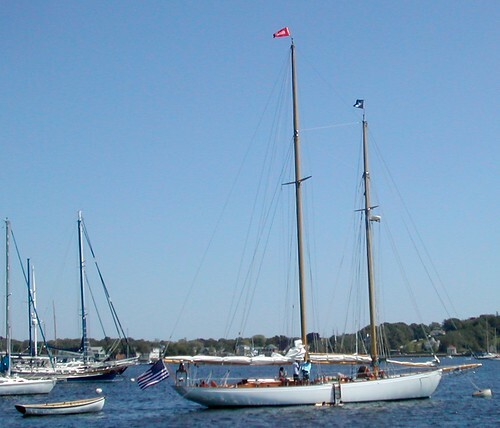 Schooner Brilliant from Mystic Seaport, photo by Willie Waw. 61-foot Brilliant was built in 1932 at the Henry B. Nevins shipyard in City Island, New York. Designed by Sparkman and Stephens, she was raced for many years and served with the Coast Guard during World War II. Brilliant is shown here at anchor in Newport with a teen group aboard -- some of them can be seen swimming alongside. Brilliant has hosted more than 9,000 adult and youth sail trainees during her illustrious sailing career. In 1933, Brilliant sailed from Nantucket Lightship to Bishop's Rock in the Scilly Islands (48nm WSW of the Lizard) in 15 days, one hour and 23 minutes. In 2000, under current Captain George Moffett, Brilliant won the race from Halifax to Amsterdam during Tall Ships 2000. For more details on the Brilliant, her history and programs, link here.